Rick and Morty Cushions: Pickle Rick, Come Watch TV Morty, & More | Nerd Much? Rick and Morty fans are still celebrating the recent news of Rick and Morty’s 70 episode extension, and with good reason. With 70 new adventures of the crazy duo to look forward to, it is easy to get carried away in all of the excitement. Well here is a good way to keep you occupied until the next season release: redecorating your favorite room with these ultra nerdy Rick and Morty cushions. While the following cushions are sold separately, let’s be real, we all know they will look great together. They’re each priced at $21.99 and are currently available for preorder now at Merchoid. Shipping is estimated to begin in July, and quantities are limited, so act fast. First up, we have the Rick and Morty:” Come Watch TV” Morty Cushion. Solve your own existential crisis with your very own Morty cushion complete with an absolutely terrified expression. After all, “everybody’s going to die, come watch T.V.” This cushion is made of 100% polyester and measures approximately 32 cm by 32cm. Next up we have the Rick and Morty: big Reveal Pickle Rick Cushion. This Pickle Rick cushion is made of 85% polyester and 15% spandex, and is filled with 100% polystyrene beads. 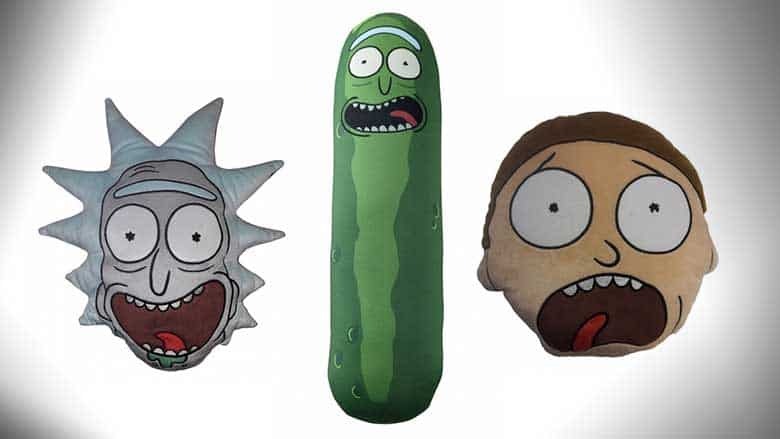 The green pickle cushion features Rick’s exuberantly inebriated expression and measures 50cm x 14 cm. Lastly, the Rick and Morty: “I am in great pain Rick” cushion. This 100% polyester cushion perfectly captures Rick with a truly crazed expression. Rick obviously needs to numb his pain, too bad he doesn’t have this comfy cushion to help. This Rick cushion measures 40 cm x 36 cm and is sure to imperfectly match your existing nerd décor. These Rick and Morty cushions are all sold individually for $21.99 at Merchoid, and are currently available in limited quantities for preorder. Buy the Rick and Morty Cushions here.